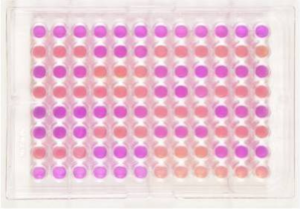 Interpret the results of the variable retention harvesting experiment that examined the relationship between living trees and microbial communities and their functioning, focusing on microbial biomass and extra-cellular enzymatic activity. Evaluate the effects of variable retention harvesting on soil microbial biomass and enzymatic activity from STEMS data. Identify potential soil biological indicators that could be used to monitor the sustainable management in CWH forests. You are already familiar with microbes (or microorganisms) in your own life (think moldy bread). In fact, your own body is home to a vibrant microbial community that directly affects your body’s functioning. Similarly, forests are home to large numbers of microbes which live in the soil and in close association with vegetation. Their small size and cryptic nature have made them difficult to study, but molecular identification techniques have allowed for a more accurate accounting for these communities. Researchers are employing these techniques to better determine the role that microbial communities have in maintaining healthy forest ecosystems. Soil microorganisms play important roles in regulating key forest ecosystem processes, such as nutrient cycling and organic matter decomposition. Living vegetation and soil microbes interact in complex ways, but the C cycle is central to understanding these interactions. Soil microbes are largely heterotrophic (i.e., they obtain both energy and C from decomposing organic matter or directly from tree roots). Hence, the presence of living trees influences the diversity and functioning of soil organisms by altering the supply of belowground C needed for microbial growth. Further, nutrients such as N, P, and S are bound in soil organic matter, and become available to plants only upon decomposition by microbially-derived enzymes. Forest harvesting methods that allow retention of certain proportion of the living trees on the site should be more beneficial to soil quality than clearcutting, which removes all the trees from the site. Examination of the symbiotic relationships between plants and fungi offers an opportunity to examine the relationship between microbial diversity and ecosystem processes. Some soil microbes form symbiotic relationships with trees to receive C directly from the tree. In return the microbes supply the tree with nutrients (particularly N and P). One prominent example is the ectomycorrhizal symbiosis (EM) that forms between fungi and a number of conifer species , and can be found throughout temperate coastal rainforests. In contrast, saprotrophic fungi obtain C needed for their growth from decaying organic matter. Tree roots may also affect bacterial communities by providing easily degradable C for microbial growth, which in turn stimulates nutrient release from organic matter. Both saprotrophic and EM fungi affect nutrient cycling by accessing nutrients bound in organic matter through enzymatic activity. However, researchers have found evidence that EM fungi may impact decomposition differently than saprotrophic fungi. 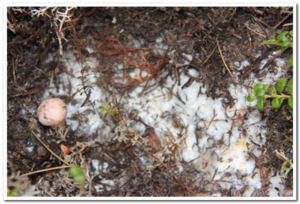 The presence of EM fungi can slow decomposition processes, possibly by competing with saprotrophic fungi and/or changing environmental factors that control decomposition such as soil water content. The presence of EM fungi may therefore help to retain nutrients in forest ecosystems, while increasing belowground C storage by slowing decomposition of soil organic matter. Throughout most of the twentieth century, forest management in British Columbia focused on sustained yield of timber from coastal forests, with clearcut harvesting being the predominant harvesting method. 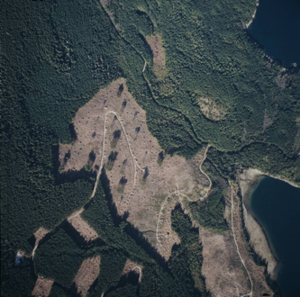 Clearcut harvesting is defined as: “an area in which the above- and below-ground influence of the trees has been removed in more than half the area” . In recent decades, forest managers have begun to transition into an ecosystem management framework, which seeks to place production of forest products within the larger context of managing forest ecosystems. Forest managers are now attempting to design and implement alternative harvesting methods that allow for timber production but also effectively maintain a wide variety of ecosystem services (e.g., clean water, C sequestration, biodiversity preservation). One of these harvesting alternatives is known as variable retention harvesting (also known as green tree retention). This type of harvesting system addresses multiple management objectives ranging from providing timber products to C sequestration to biodiversity protection . In British Columbia, forest managers have been increasingly implementing variable tree retention harvesting techniques to retain structural diversity and provide habitat associated with old-growth forests. The potential benefits of implementation of this method over clearcut harvesting include: increased wildlife habitat associated with snags, provision of seed source, and reduction of post-harvest losses of soil C. From a belowground perspective, the key issues are how variations in retention density affect the soil’s ability to maintain microbial communities and processes at levels comparable to unharvested areas, and how far effects extend beyond retention patches. 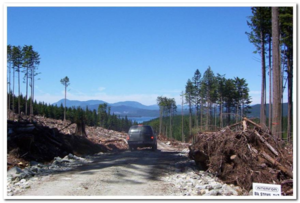 Data for this case study were obtained at the Silviculture Treatments for Ecosystem Management in the Sayward (STEMS) long-term experiment near Campbell River on Vancouver Island, British Columbia. This is a second-growth forest located in the Coastal Western Hemlock (CWH) biogeoclimatic zone, where the dominant tree species are western hemlock and Douglas-fir. The study site is located in a humid, maritime region on a loamy sand Duric Humo-Ferric Podzol. Please note that only treatments used in this case study are mentioned below. For more information on the study site, and additional treatments not used in this case study, please visit STEMS website as well as website for this case study. Soils samples were collected 5 years after harvest. Samples were taken from the mineral soil (to a depth of 10 cm). In the dispersed and aggregate retention treatments (Figure 1), samples were taken at four locations along four 30-m long transect. The samples were taken at the centre of the retention patch (aggregate treatment) or next to the tree (dispersed treatment) and at 10, 20, and 30 meters from the retention patch edge (or tree) (Note that the edge location was not used for this case study). In the aggregate and dispersed treatments, measurements taken along the four points at each transect were averaged to compare treatment differences. In the clearcut and uncut forest, samples were taken at four random locations (Figure 1). Microbial biomass was assessed through phospholipid fatty acids (PLFA) profiling. The identity of the ectomycorrhizal community was determined through molecular identification methods: PCR-DGGE (Polymerase Chain Reaction - Denaturing Gradient Gel Electrophoresis) analysis of the ITS (internal transcribed spacer) region for fungi . Microbial enzymatic activity was assessed by measuring two important nutrient cycling enzymes (1) peroxidase, which catalyzes lignin decomposition and (2) phosphatase, which releases plant-available phosphate from organic phosphorus sources (Sinsabaugh et al. 2004). Discuss the major types of microbes in forest soils. What is variable retention harvesting? What are the key soil properties that are of an importance for management of Coastal Western Hemlock (CWH) biogeoclimatic zone forests? What are the most common types of soil microbes in forest soils? What are the key roles of soil microbes in forest ecosystems? Review background information on management practices carried out on the study sites. Gain basic understanding of enzymatic activities that affect belowground processes. Review the soil microbial biomass and enzymatic data collected from four treatments at the STEMS site (Table 1). Qualitatively relate data from Table 1 with ectomycorrhizal species richness data (Figure 2). Assess how changes in microbial biomass and enzymatic activity after harvesting might affect soil quality. NOTE: Before next week’s session, your team should research any gaps in knowledge regarding the guiding questions for today’s session. Which groups of soil microorganisms are responsible for enzymes that decompose organic matter in forest ecosystems? How do soil microbial communities influence healthy soil functioning? How does enzymatic activity impact soil health? Based on the data in Table 1, what can you infer about the effects of variable retention harvesting on soil microbial biomass and enzymatic activity? Did dispersed and aggregate retention treatments result in greater or lower microbial biomass and enzymatic activity relative to the clearcut? Explain your answer. 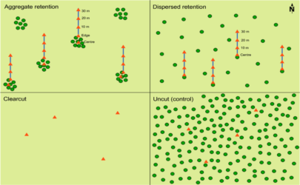 Did dispersed and aggregate retention treatments result in greater or lower microbial biomass and enzymatic activity relative to the adjacent uncut forest? Explain your answer. Prescott C.E. 2010. Litter decomposition: what controls it and how can we alter it to sequester more carbon in forest soils? Biogeochemistry 101:133-149.
Review the soil microbial biomass and enzymatic activity data collected from the dispersed and aggregate retention treatments (Table 2) to assess effects of living trees. Qualitatively relate data from Table 2 with ectomycorrhizal species richness data shown in Figure 3. Develop a soil quality framework that links microbial communities and enzymatic activity to variable retention harvesting in CWH forests. NOTE: Before next week’s session, your team should research any gaps in knowledge regarding the guiding questions for today’s session. Start preparing for the group presentation and please consult guidelines given in the course syllabus. During week 3, focus on the following sections of the “It’s Alive” website: (a) Decomposition and (b) Sampling and analyses. How far beyond retention patches were effects of variable retention harvesting still noticeable on microbial biomass and enzymatic activity? Focus on Table 2. Focusing on Table 2, were there any differences between aggregate and dispersed treatments regarding their effects on microbial biomass and enzymatic activity? What are some strengths and limitations of using soil microbes and enzymatic activity to monitor soil quality in CWH forests? Each group will present results of their work on this month’s case (please remember that your presentation should be max 20 minutes long) and along with the instructors will compare and contrast the methods of diagnosis and interpretations of soil biological quality in the case studies. The presentations will be evaluated on the basis of content, structure, and delivery. One of the signs of successful presentation is how well the presentation engages other groups into discussion. ↑ 1.01.1 Sylvia D.M., Fuhrmann J.J., Hartel P., and Zuberer D.A. 2004. Principles and applications of soil microbiology. 2nd edition. Prentice Hall. ↑ Rosenvald R., and Lohmus A. 2008. For what, when, and where is green-tree retention better than clear-cutting? A review of the biodiversity aspects. Forest Ecology and Management 255:1-15.